Come for the race, stay for the treasure hunting! 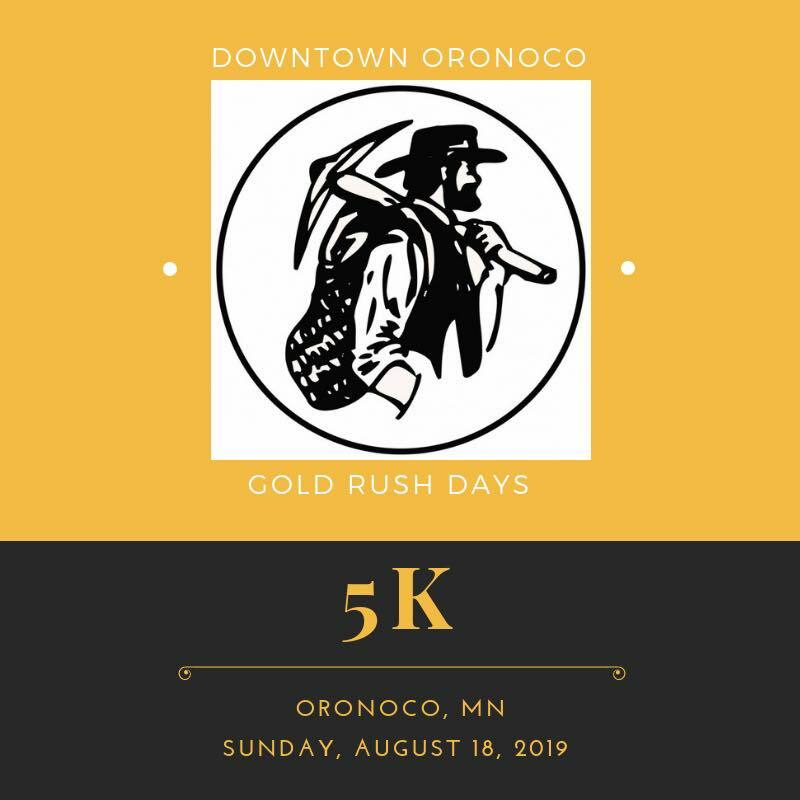 Join us for the 2nd annual Downtown Oronoco Gold Rush Days 5k! Last year's 5k was very well received and we are happy to bring it back in 2019! 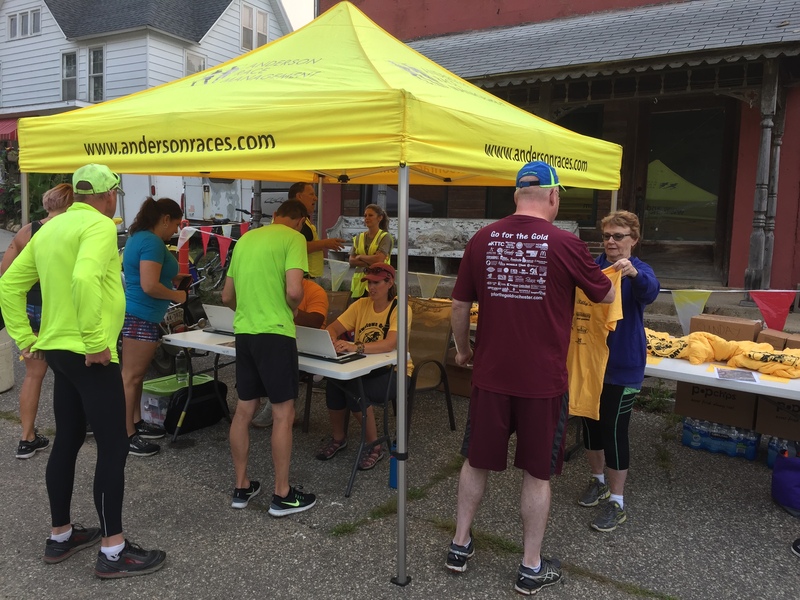 This year your registration includes a run through historic Downtown Oronoco and a t-shirt. We are so excited to once again offer this event during our weekend festivities and hope to see you there! Parking is available Downtown Oronoco for a small fee. Street parking a short walk from Downtown Oronoco is also available. Posted in Entertainment, family fun, Informational. Tags: 5k, Downtown Orocono Gold Rush Event, Oronoco 5k, Oronoco Gold Rush on August 17, 2018 by Patsy Matts. On Earth Day 2019, we invite you to do the earth and yourselves a favor by planning to shop second hand at Downtown Oronoco Gold Rush Days, August 16th, 17th, and 18th. 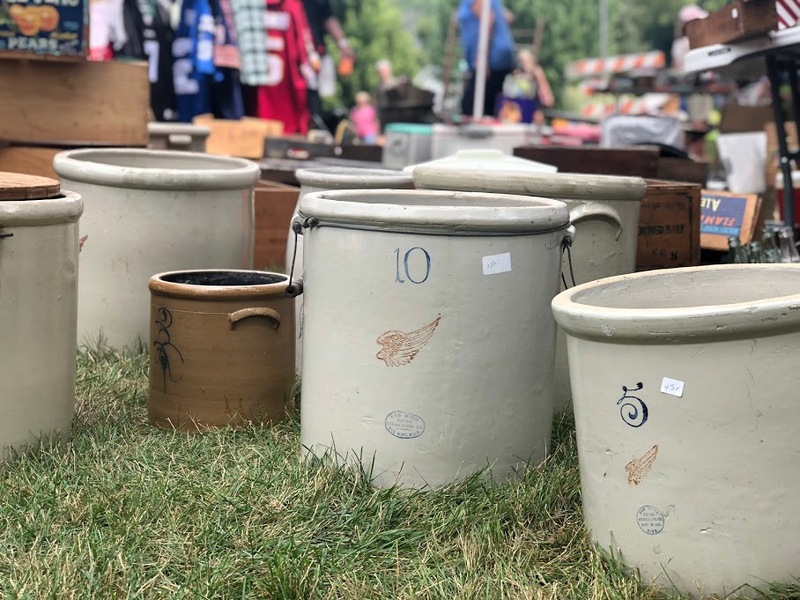 Flea Markets and antique shows are full of second hand items just waiting to be repurposed, reimagined and ultimately recycled. Downtown Oronoco Gold Rush Days is no exception. Shopping second hand not only helps the Earth; there are also social and personal benefits to visiting your local flea market or thrift store. We've highlighted our favorite reasons why we think you should consider this option when shopping for clothing, home decor, furniture and more. When you purchase a piece of clothing or furniture second hand, you are playing an important part in reducing the consumption of energy and resources that are necessary in producing new items. You are also giving new life to something that may have otherwise been tossed. Be proud of your second hand items and your positive impact it has on this earth! Shopping second hand at a flea market ensures that you will be supporting small and local businesses. This support of local businesses will keep your dollars close to home, multiplying their effect throughout your community. The small but impactful decision to shop second hand can have many positive outcomes on your life, and the lives of your friends and neighbors. The most obvious benefit of shopping second hand is that it can be significantly less expensive than buying new. The not so obvious benefit is that you are able to put your own personal touch on your purchase and it will likely be more unique than anything you could buy new. This is a huge plus when looking to create your own personal style within your home or wardrobe. Originality is a priceless reason to shop second hand! Besides all the wonderful reasons mentioned above, Downtown Oronoco Gold Rush Days is just plain old fun! Whether you are looking for that perfect bench to complete your entryway, that one last piece of pottery to finish your collection, or you just want to wander the vendor booths eating a delicious ice cream sandwich, there is something interesting for everyone! We hope you can join us on August 16th, 17th, and 18th! Posted in Community, family fun, Informational. Tags: Earth Day, Flea Market, Second Hand on April 22, 2019 by Dana Bergner. Comfortable Rest After Your Day of Shopping! Posted in Uncategorized. Tags: lodging near oronoco on January 10, 2019 by Gold Rush. 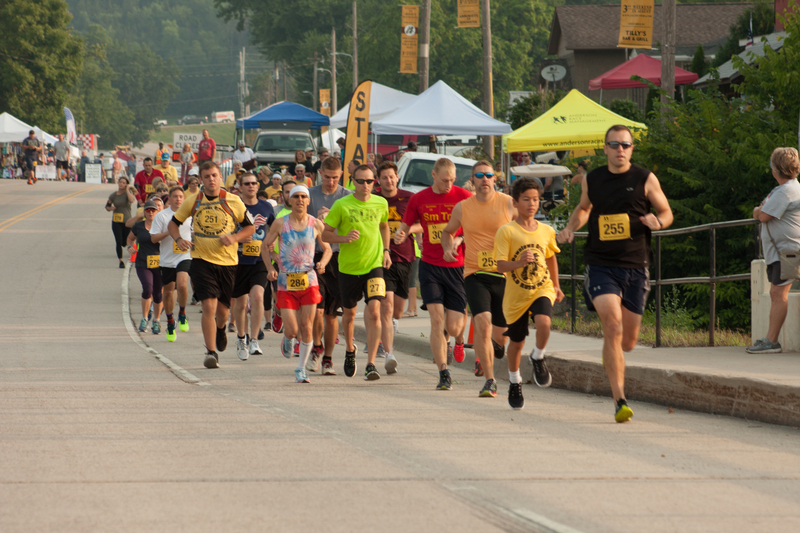 We have Jeff Hovel to thank for the photos from the very first Downtown Oronoco Gold Rush 5K. Jeff is a resident of Oronoco and asked permission to take photos to share with us. He did not charge a fee for doing this, but did the photography as an act of charity and service. For this we are grateful. Posted in Community, Entertainment, family fun on September 30, 2018 by Patsy Matts. Downtown Oronoco Gold Rush is ready to share the proceeds! Gold Rush 2018 was a success! The vendors, food vendors and crowds enjoyed this year’s Gold Rush! 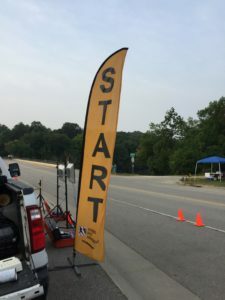 The first 5K event was exciting to see a new venture happening and more importantly, runners and walkers with their yellow bibs walking around and taking in Gold Rush, as well! 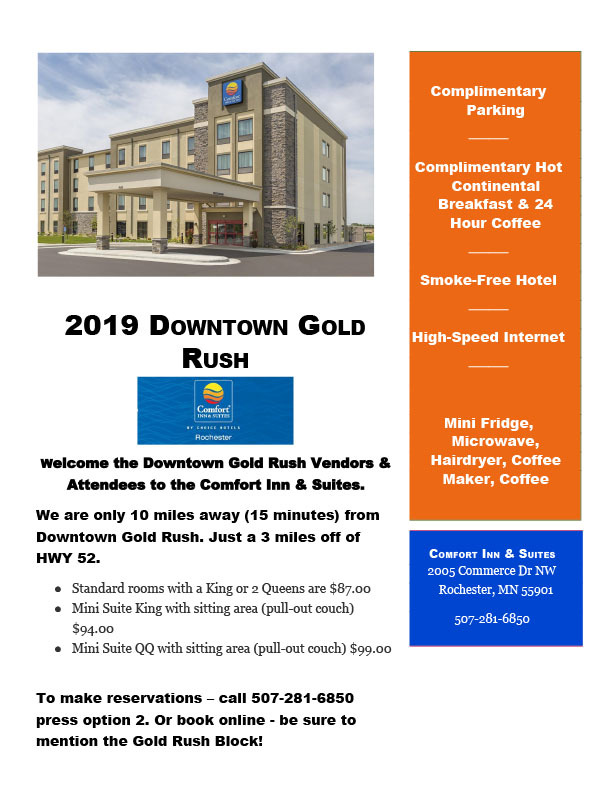 The Gold Rush committee has start planning for the 2019 Gold Rush weekend, August 16, 17 & 18! If you have comments or interested in the Gold Rush committee meeting discussion, please visit our monthly meetings, the 2nd Monday of very month at 6PM at City Hall. All are welcome! Now that this years Gold Rush is in the books, it time for organizations to submit their donation requests to the Gold Rush committee for consideration. Downtown Oronoco Gold Rush Days is a non-profit organization, so after the committee have paid it’s expenses, the committee will review requested donations. The committee is asking that donation requests be received by Oct 5th, so they can be reviewed at the monthly Oct 8th Gold Rush committee meeting. You can submit requests to the Gold Rush committee by mailing to ‘Gold Rush Committee, PO Box 266, Oronoco, MN 55960’, email to goldrush@bevcomm.net or dropping them off at City Hall. Posted in Uncategorized on September 29, 2018 by Patsy Matts. 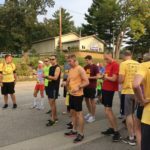 Oronoco’s 2018 5K was a Great Success! On Sunday morning August 19th Oronoco began a new tradition. 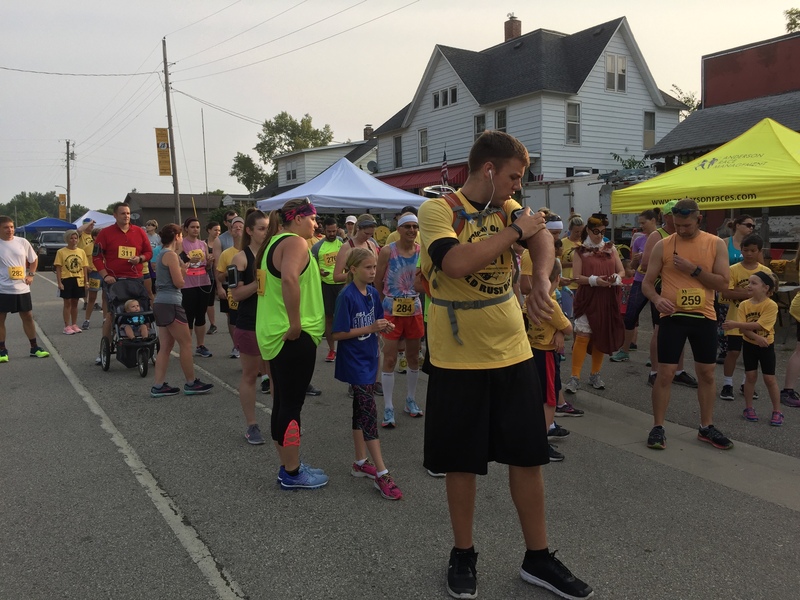 Oronoco residents put together their first 5K and had it coincide with the Downtown Oronoco Gold Rush Days. Many participants registered months in advance, and some registered on Thursday evening at the Oronoco Presbyterian Church. The last to decide came to Oronoco at 7 o'clock am to register to walk or run the 5K. As the people arrived the energy of Oronoco rose with excitement. Many showed up with their children and others had a buddy or came alone. All came ready to have a good time. The sun is barely up as these runners arrive. As they began to form a crowd more and more of the Gold t-shirts dotted the street. And the weather could not have been more co-operative. The race was scheduled to begin at 8 am. and there was a pleasant breeze. 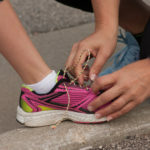 We call this a tradition even though this was the first year that Oronoco sponsored a 5K. And for such a small town the turnout was good. The path they would travel began on the North side of the bridge where the old dam used to be. After crossing the bridge and making their way up Minnesota Ave the group moved into a residential neighborhood, and followed a paved path through the woods along the Zumbro River. At the start of the race was the clock to record each persons time. The path is lined with yellow flowers 5 foot tall. By the time the group gets to this part of the run there are wide gaps between the runners and walkers. There are runners who came to beat their own time, from a run done somewhere before Oronoco. For others who are bringing up the rear, they have no intention of hurrying this moment. They are relaxed and enjoying all of the beauty Oronoco presents. Make a trip to Oronco one of the items on your list of "must do's" so next time you will be here for the line up. Besides this 5K, and the Downtown Oronoco Gold Rush Days, we have a Frisbee golf course, a river to contemplate, and the Oronoco City Park for camping. Many parks have playgrounds for the kids, and in the winter the Lions Club puts up the walls for the basketball court to become an ice skating rink. Yes Oronoco, just North of Rochester is growing into a "big, little town" where we treasure our visitors, along with our fellow residents. Posted in Entertainment, family fun. 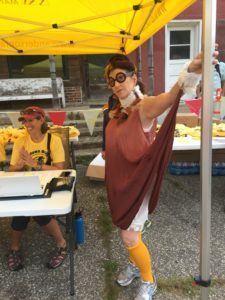 Tags: Downtown Oronoco Gold Rush Days, Oronoco 5k on August 22, 2018 by Patsy Matts.